This company was born in 1898 and its path became steady especially after World War II, when it adopted the name ‘Pasta Zara’, in honour of the pasta factory opened in the Thirties in the Dalmatian city Zadar (Zara), which at that time was Italian territory. It is still family-owned business (Bragagnolo) and today it reached the fourth generational passage, under the chairmanship of Furio Bragagnolo. This company is the number one in Italy for pasta exports worldwide and number two for domestic production, with 400,000 tonnes per year. Sales, which exceeded 280 million Euros, for 90% are the fruit of the over 100 foreign markets where the brand is present, and 10% come from sales in Italy, where the company mainly operates as a co-packer for retailers. Three production plants, the largest of which is at Muggia, in the province of Trieste, two mills that work exclusively, and a large commercial network for constant growth abroad: these are just some of the key ingredients that have led Pasta Zara to win all five continents, with a wide range of quality products and in majority Italian wheat. Franco Bragagnolo has focused on exports since 1975. He soon achieved the first results in Austria, Germany, and Greece. 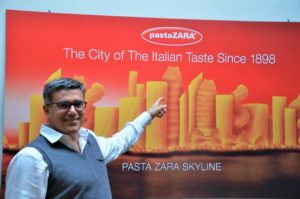 The drive for constant research and innovation is important for Pasta Zara: from investment in technology to reduction of load times and energy costs (fully automated warehouse, cogeneration system, use of photovoltaic plants), to creative evolution of primary and secondary packaging (which requires more attention abroad), of course passing through the study and launch of new products. There are eighty different pasta formats, designed to meet the growing segmentation of consumption needs and with maximum attention to every single production step, in order to ensure at the same time convenience in price. The placement covers all ranges, from the standard one, with a classic proposal with red package (12.5% ​​proteins), to the premium, bronze-drawn one, with 14.5% proteins. Focus is also oriented on the health and well-being department, thanks to a wide offer ranging from organic to whole products, spelt and gluten-free, with corn and rice. A pasta with the addition of white oat fibre is planned, while a recipe that can guarantee a lower glycemic index than the average is under study. President Bragagnolo says: ‘Our goal abroad consists in helping love Italian first courses’. Hence the choice to include five ready-made tomato sauces for a traditional combination.